Shane Byrne has started the seventh round of the British Superbike Championship at Oulton Park from where he left off last time he visited the Cheshire circuit. Byrne, who took a double victory here back in May, used the same setting yesterday morning in the opening practice session of the weekend and was immediately on the pace, completing FP1 second fastest. And after playing around with tyre selection in the ever changing conditions here at Oulton this weekend, Byrne improved his time in the afternoon to a 1.37.142 which was good enough for third fastest overall in Free Practice 2 behind Karl Harris and Cal Crutchlow. But Shakey said after the session he knows he can go faster and potentially improve on his 97-point championship lead. He said: “After achieving such great results the last time we were here, I felt happy with the settings I had so I started the day with those and went from there. “The first session went pretty much as expected but I decided to sit out the first half of the second session because of the rain. “Once the circuit had dried I had enough time to try a different rear Pirelli tyre on the Airwaves Ducati 1098R and improve my lap times from this morning. “I’m confident that I could have gone faster still but I came across traffic towards the end of the session. 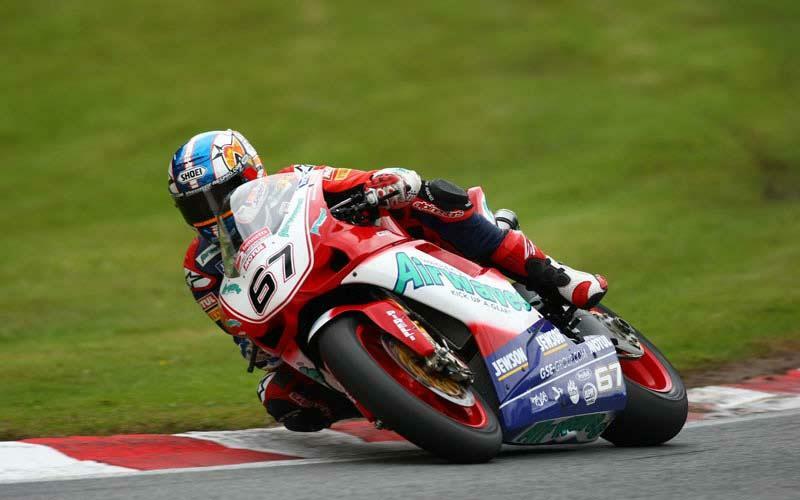 Team-mate Leon Camier set the fifth fastest time overall with a 1.37.268, a time already eighth tenths faster than his qualifying time from the May race weekend at Oulton. And much of that improvement has come from a change to his Airwaves Ducati allowing him to carry more corner entry speed. “This morning’s session was good for us to get a feel for the recent changes we made to the settings on my Airwaves Ducati,” said the 21-year old. “It all felt really positive but I can still see where the potential lies for further improvements. “It was a shame that it rained for the first part of the second practice session but I’m happy with my lap times and in particular how much quicker I am compared to when we were here in May; I’m feeling confident about the weekend ahead”.